Hoad Monument, commemorating Sir John Barrow, Ulverston, Cumbria. Waterlilies I, Ulverston Canal, Cumbria. Waterlilies II, Ulverston Canal, Cumbria. Waterlilies III, Ulverston Canal, Cumbria. GlaxoSmithKline pharmaceutical works, Ulverston. Cumbria. Rider on Ulverston Sands, Cumbria. Rampside Lighthouse also known as “The Needle”, Rampside, Cumbria. Rampside Gas Terminal I, Barrow-in-Furness, Cumbria. Rampside Gas Terminal II, Barrow-in-Furness, Cumbria. Wonderful skies Quintin. Sadly the Isle of Wight not so bright and clear this week ! Thanks Bob, these pictures were taken a month ago. Those were the days! Ah yes I remember that industry around Barrow in Furness. Flare stacks, noise and funny smells. Not very pleasant. Going to do Walney Island? 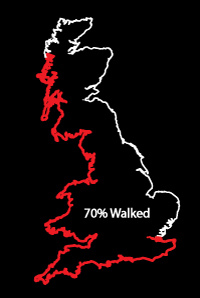 I’ve heard it’s very interesting but I’m not including islands in my walk – I wanted an unbroken line for this project and there are 6,289 islands around Britain! The needle image looks quite surreal actually! it does, more like an artwork than a navigation aid! Just want to say what a wonderful range of photographs. Your locations have reminded me of happier times. The beauty of the compositions helps focus my mind better than any mindfulness course. Thanks Daphne, glad to here these are giving you some serenity. I strive to find balance in the compositions often with many alternate versions rejected before selecting the one that looks right to me, which is often the calmest. Great variety of pictures. Great job!